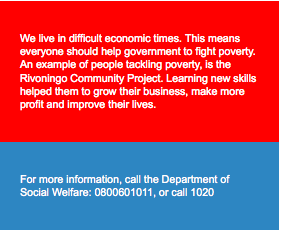 The Rivoningo Community Project, which was started in 2005, is a pig farming business. Based in the village of Sasekani near Tzaneen in Limpopo, they are now selling more than 50 pigs a month to different abattoirs in the province. Project members were able to start the business after officials from the Department of Social Development visited the project. They realised that there was a need for training because pig farming is a specialised field, which requires specific skills and knowledge. So they offered them community courses in pig farming. The courses offered to the community are in line with government's Joint Initiative for Priority Skills Acquisition (Jipsa). Through Jipsa, government identifies scarce skills and puts plans into action to develop such skills. The courses offered to the community included topics like pig welfare, diseases and vaccinations, piglet rearing, nutrition, reproduction and accommodation. They were given practical information about the importance of good hygiene, how to reduce stress in pigs, how often they should be fed, keeping healthy pigs away from sick ones, and keeping piglets warm. Learning new skills has enabled them to raise healthier pigs and prevent pigs dying from diseases. It also helps them to increase the number of pigs they sell, which means they are making a bigger profit. This, in turn, benefits the whole community as they are fighting poverty in these difficult economic times.